Cake originally made for the Princess in May 2008. My oldest daughter was turning three and she was obsessed with the Disney Princesses. 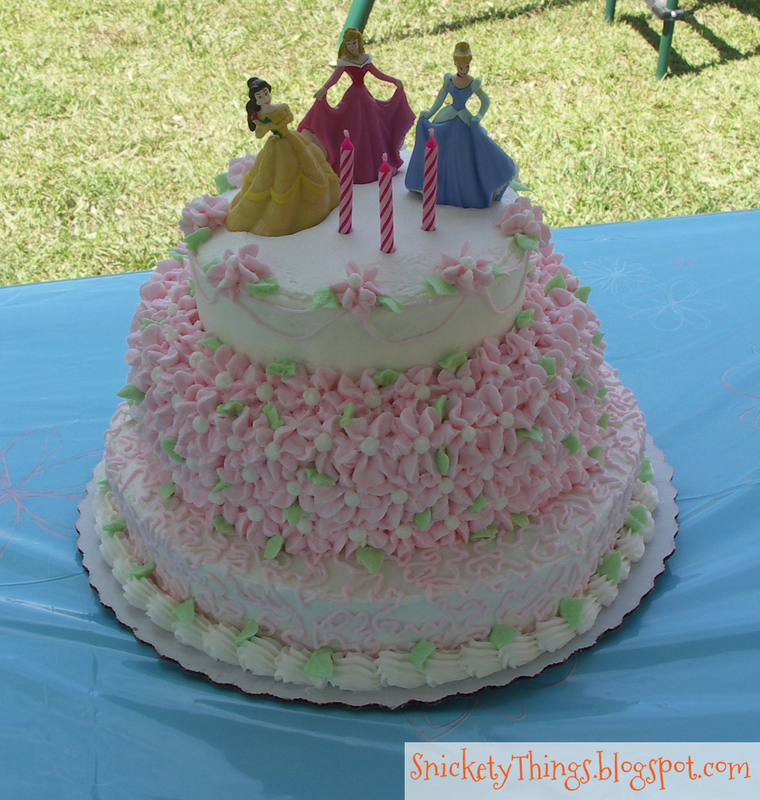 I decided to make her a cake fit for a princess. This was my first attempt in making a taller stacked cake. 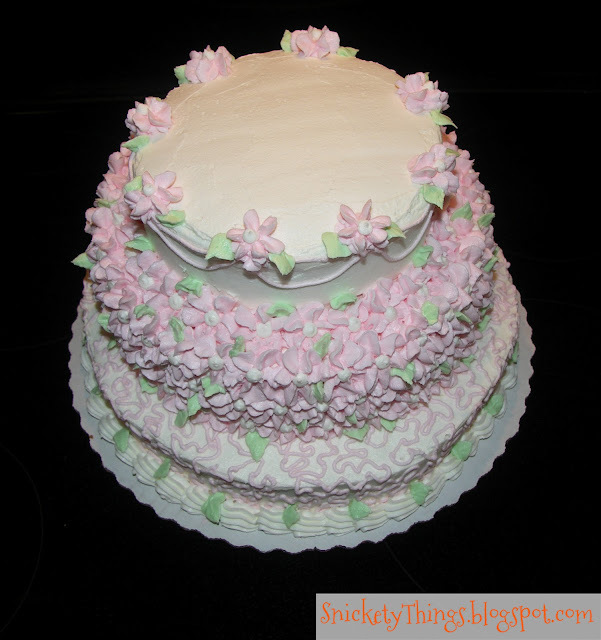 I started with baking and icing a three layers at 10 inches, 8 inches and 6 inches. I iced the entire cake in basic white, or the white that I got without adding anything to my buttercream recipe. I applied cornelli lace to the bottom layer, flowers on the middle and just a bit of string work and flower accents on the top. Here is a shot of the cake as I had it finished the night before the party. Although I knew you were supposed to support taller cakes from within, I took a chance on this one and didn't do anything to it. 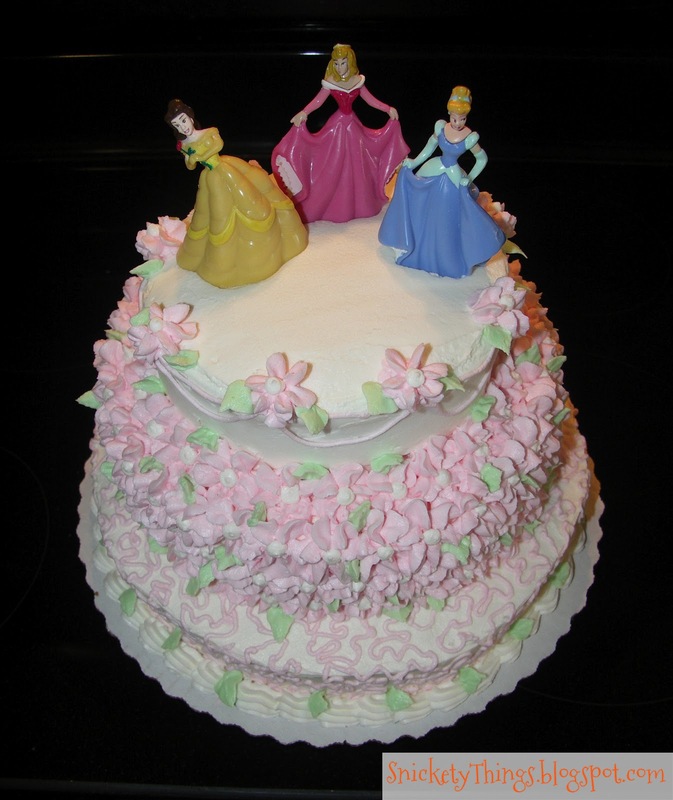 Here it is with the three Princesses she chose for the top of the cake. I just went with the small toys from Walmart and was also able to count those as part of her presents. I was not big on putting toys directly on a cake even after I washed them so these have a very this piece of plastic wrap between them and the cake. My daughter was thrilled with how it turned out and she told me she felt like a princess. And here is a close shot with the candles. If you have any questions on how I did anything, just ask! I got these when you could still buy them at Walmart without ordering a cake. You can't get them anymore. This is fantastic! I'm currently practicing on cakes for my sister's wedding this summer! 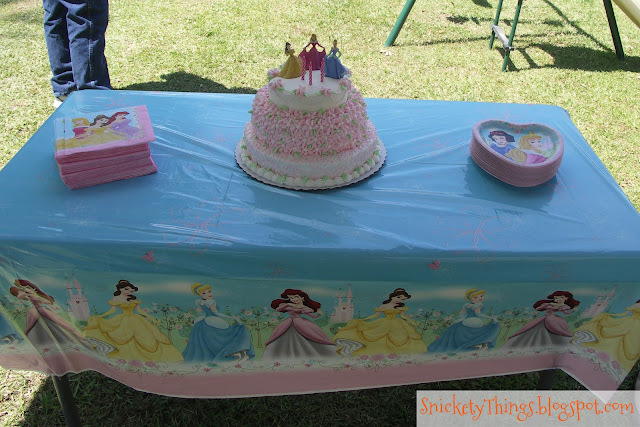 On a princess note, I'm planning on making some of these skirts or aprons for a friend's daughter who LOVES disney princesses! Oh, I really like the ones in the second link. Wow, that is beautiful, my daughter would love it. great job! Thank you! I'm still working on my piping. Beautiful cake! I just became a follower and would love for you to stop by my brand new blog and follow me too :) thanks!! Done! I look forward to reading your blog. Thank you. A friend did that for me when I did the duck cake.